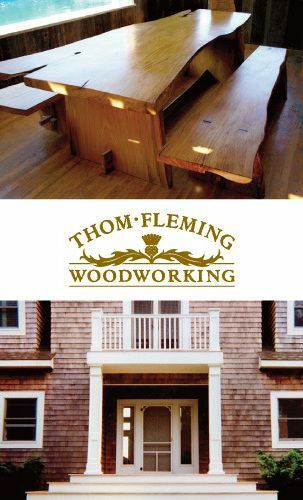 For over 25 years Thom Fleming Woodworking has offered the highest level of custom carpentry and woodworking to clients on the East End of Long Island and beyond. From completely restoring 100-year old oceanfront cottages, to designing modern built-in cabinets, to crafting a one-of -a-kind coffee table from driftwood, Thom's aesthetic and attention to detail is evident in everything he does. Thom's personal style balances a heritage of New England coastal architecture with an appreciation for natural, 'found' materials — driftwood, weathered barn wood, ancient East Hampton elm trees — to create pieces that are unique yet at home anywhere. Thom's clients, (many of whom are repeat customers), include well known artists, photographers, designers and architects who appreciate his collaborative approach as well as his 'eye'. Thom is equally at home developing designs with his clients as he is working from existing architectural plans.